...And who can forget dance lessons at the Pink Barn or Skilly's? Or Boot's Drive In at 17th & Sheridan; Miller's Drive In on Admiral? And whatever happened to the "Pink Barn Dancers" and that studio? Think it was on Memorial 'tween 15th and 21st. I'm a native Tulsan and love this site. Much to my utter surprise..I am "featured" as a dancer on the Dance Party photo along with my girlfriend (red hair).Think this was in '68 or the 8th grade. 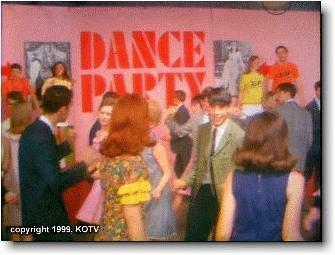 I am the one with sport coat probably dancing the bugaloo that I just learned at Pink Barn. Million in one shot that this particular photo was selected. Anyway, hello to all my family and friends. Too bad there isn't a photo of me when I was on Big Bill. The Pink Barn. I had completely forgotten about it for at least 30 years, until TTVM reminded me. taking dancing lessons! And some of the teenagers were girls! I went into shock and was unable to resist or even speak. I was probably 13 or 14, and Id probably never touched another girl other than to slug one of my sisters. I was starting to find girls interesting to look at, but they were so mysterious I had no intention of ever speaking with one. I stumbled into the Pink Barn, too terrified to be angry. And for that night, and for many other weekly lessons thereafter, I continued to stumble, around a dance floor, with a girl. It was the worst form of terror. The first night, a dizzying vortex of skirts, seemed to never end. I began plotting revenge. Soon, I was required to put my arms around a girl. I didnt think I could do it. My hands shook, my heart pounded, the sweat ran down my back. But, amazingly, the girl helped me do it. And smiled at me. My parents were probably a bit concerned with my bookish ways and lack of social skills. The Pink Barn must have had a shrewd advertising message that appealed to them. For one thing, teenage students at the Pink Barn were not allowed to leave the building, for any reason, until their parents pulled up in their car. I saw this enforced, quite strongly, on more than one occasion. My mother spoke of this policy with admiration, and told her friends about how the Pink Barn maintained wholesome values or something like that. I remember the Pink Barns dance floor was in a rather odd building. The room was unusually narrow. When the girls and boys lined up on opposite sides of the room, they were still pretty close to each other. And the room was long, with the record player in the center against one wall. We had quite a number of dances that required cavorting all the way from one end to the other. The ceiling was very low, too. As I recall, the room was also dark, with sort of a rough wood paneling. But there was enough lighting to deter couples from any funny business in a dark corner. I remember the instructors, Jerry and Roberta Keith, as being fairly young. They seemed to have a good empathy with the students. When I started at the Pink Barn, I didnt know any of the other kids. Most of them seemed to be from junior highs in the east and south parts of town. The socs and greasers thing (see "The Outsiders") was still going on and although I wasnt a greaser, I came from a predominantly greaser school (Hamilton). But I dont think anybody at the Pink Barn looked down upon me or treated me any differently. Looking back, Im sure I wasnt the only one who was nervous and uncomfortable. A few of the kids, thoughthe ones who seemed to already have good social skillsthrived at the Pink Barn. Still, Im sure for most of us it was a valuable learning experience. Although I was never very outgoing through my teenage years, I think that without the Pink Barn I would have been even worseprobably an unbearable geek with no friends. Thank you, Jerry and Roberta, wherever you are. 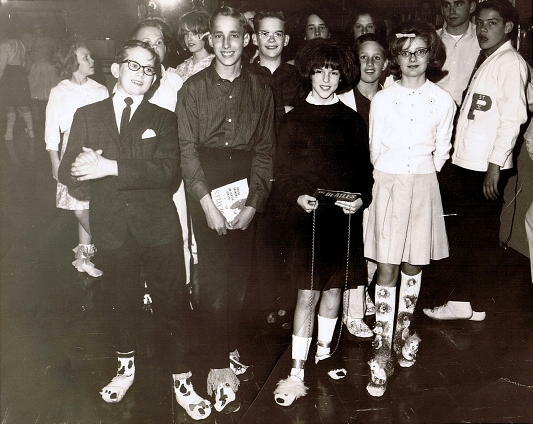 I ran across a pic from circa 1967 Pink Barn, of my brother and some others in their "fancy fixed up" socks. My brother Jesse has been working on the names of the kids in this picture, and he remembered a few and found the ones he could in his Whitney yearbooks. He made the outline for the names.The unknowns probably were either Skelly kids or ones he didn't know personally.This was a picture taken in 1965 or 1966, and it was the 1st and 2nd place winners for Best Socks Award.....male and female.So there ya go and I hope some of the kids will recognize themselves and let you know. Last night I talked with my mom (age 82) about the Pink Barn. Just like me, she had forgotten all about it. She thinks that since it was such a struggle to get me to go week after week, I didnt attend very long. To my memory, it seemed to last for months and monthsbut I do recall that as time went on I didnt mind it quite so much. She did recall very clearly the Pink Barns strict policy of not letting students leave the building until their parents pulled up in their cars. I also thanked her for sending me to the Pink Barn. It probably helped, at least a little, with my social skills, which were pretty pathetic for most of my teen years. My wife then reminded my mom that Im a pretty good ballroom dancer. Ive enjoyed lessons as an adult, and Im sure the Pink Barn helped with that too. I couldnt thank my dad. He died in Claremore, age 88, on 23 May 2008, just three days before Memorial Day. He was an A-20 pilot with 75 combat missions in World War 2, and worked in engine maintenance at the American Airlines Engineering Center in Tulsa until 1980. Hey yay yay yay . . .
No they may not ever be explained. Webmaster: I had forgotten about the "Totten" Studio. Where was it? 31st & Sheridan? As a kid, I decided that "Totten" was an misspelled attempt to say "Tot-teen". I didn't imagine it to be a name, since they already had a famous one. Why would they need another? Art with Lee Woodward & Lionel. Maybe Art was here promoting his studio. "Skilly's" was the dance school of choice, for the south side of Tulsa, anyway. Skilly Forsman was the major-domo of that school. My daughter even taught there for a year or two. This website is wonderful. I loved all the commentary about the Plaza Theater. 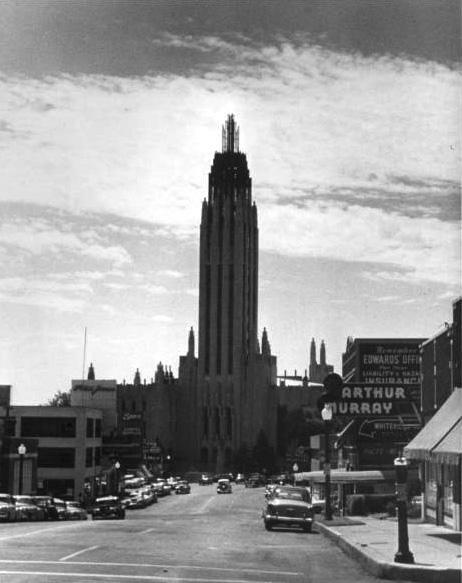 My grandfather owned that building (General Alva J. Niles) and I took dancing at Skilly's on the second floor of the buildings around the corner on 15th. My mother lived in a house on the southern end of the block that Central High School occupies. The school was evidently built in two sections, the north one first. Skilly's School of Ballroom Dancing was part of the passage from the awkward, inexperienced junior high years to the senior high social scene. Skilly and her husband, Bob Forsman, taught you, not only how to dance, but what to do on a date, something that helped young boys gain confidence in their struggle to develop skills to deal with their new urges and the strange, new creatures that were called "girls." If I remember correctly, the cost of the series of lessons was something like ten dollars. It might have been more, but in the late 40s, ten dollars was a lot. Skilly was a beauty, but it was an icy beauty. I heard that she and Bob divorced. They both had strong personalities, particulary Skilly. I also understand that she continued to teach dancing up into her later years, still retaining her attractiveness. Skilly simplified the swing dance/Jitterbug/Lindy Hop. Although I was aware of the term Jitterbug, I only heard the term swing dance used for what we did.. I didn't hear the term Lindy or Lindy Hop until I got into the Navy and met people from back East. The word "Jitterbug" also seemed to be more applicable to the more wild, fast dance of the black folks, although we did apply it occasionally to the swing dance. Skilly's legacy lives on. When you go to high school and college reunions, you can continue to see old geezers still doing the swing dance the way Skilly taught us. Boston Avenue Methodist Church was also seen in "The Outsiders"
When I was at TU - they brought the best of the Broadway Equity road shows to the "old Lady of Brady". 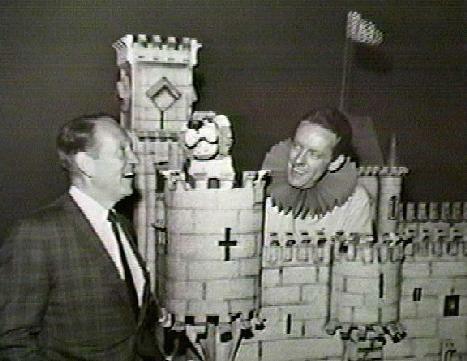 The late Beaumont Bruestle told us in class that Tulsa almost got cut off the list of traveling shows because of bad, ratty (worn and the four-legged kind) dressing rooms and often an issue of heat or cooling in the house. Beaumont Bruestle was right. My dad, Lew Miller, was a theatrical booking agent during the 40s and 50s and ran a dance studio at 15th and Newport. He used to talk about the stage of the old theater on West Brady that was not level, but slanted toward the orchestra pit. It was so bad some dancers refused to perform on it, fearing they might fall onto a tuba or worse. I believe at least one did fall off that stage. I remember seeing many a performance there from dance recitals to Olsen and Johnson, a popular comedy team of vaudeville and Broadway. My father booked Louis Armstrong at the theater as well as other performers and bands. Incidentally, the Louie Miller who disappeared in the lyrics of "Mack the Knife" was not my dad. Webmaster: Read more in Mike's excellent book, How High Can a Guy Stoop? I lived in that dance studio Mike Miller mentioned! Of course at that time (early 80s), it was a house of freaks/punk rock crash pad. The landlord never came to collect rent more than once. You could roller skate on that huge wood floor, and we did! I do apologize for the shame my friends and I brought that neat old house. We did have some killer concerts in the basement though. I was good friends with international punk rock sensation "N.O.T.A." at the time and I asked them what it would cost me to have them play at a party and they said "just get us drunk" which we did. It was during a peak period for them and that style of music and it was an unforgettable show. It was an adventure living there even for just those few months and sorry about all that spray paint. Shameful and noisy, yes, but at least we didn't tear it down and put up those awful McHouses in its place. Is the house where the dance studio once was on the southwest corner of 15th and Newport? I think I remember that being a tap and ballet studio in the 60s. Many of my friends took dance lessons there while I took ballet at a studio close to 21st and Memorial. I think the owner of the studio (on Newport) was June Runyan (Runyon?) or maybe Regina Smith. I just remember seeing that house on the way to Boston Avenue Methodist as a child and thinking it was a ballet studio. I could be all wrong on this one. 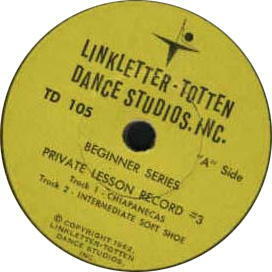 The Lew Miller Dance Studio was on the Northwest corner of 15th and Newport. I grew up there walking or riding my bike to Lincoln and later Marquette. I'd often run into Tulsans who would say, "Your dad taught me and my mother took lessons from him before me." June Runyon and Regina Smith had dance studios down 15th a block or two closer to the old Midland Valley RR Bridge. I think Regina specialized in ballet. There was a doctor's office building directly across Newport. My dad sold it in the 80s several years before his death. It did have two wood floor teaching levels that would make for good roller skating. It was great for parties and dances when I was in H.S. I was a bit shocked to see the site has become part of a trendy patio home development. And for the record, it was June Runyon who specialized in ballet, not Regina Smith. Memory is the second thing to go. I was required (forced) to take ballet lessons from a teacher at my dad's dance studio. However, I never found a job that required even an occasional pirouette. Hey, I remember June Runyon's dance studio very well. My best friend and I would often stop by on our way home from school (Marquette at 15th and Rockford). We would dash up onto the porch and begin our spastic little mockeries of the "victims" inside the house taking ballet lessons. Sometimes, the teacher, who we assumed to be Miss Runyon herself, would halt the class and allow the students to "enjoy" our feeble attempts to gain attention from them. Other times she would simply ask us to go away - an offer which we refused, again and again. Seems like somebody was always chasing us away from somewhere!? Guess it's true, "No good deed goes unpunished!"